‘Twas the night before Christmas, and Santa sat with a frown. His sleigh GPS had broken, he wouldn’t know up from down. his chief elf burst in, and yelled “I have the answer! You need a device you can trust, something tried and true. 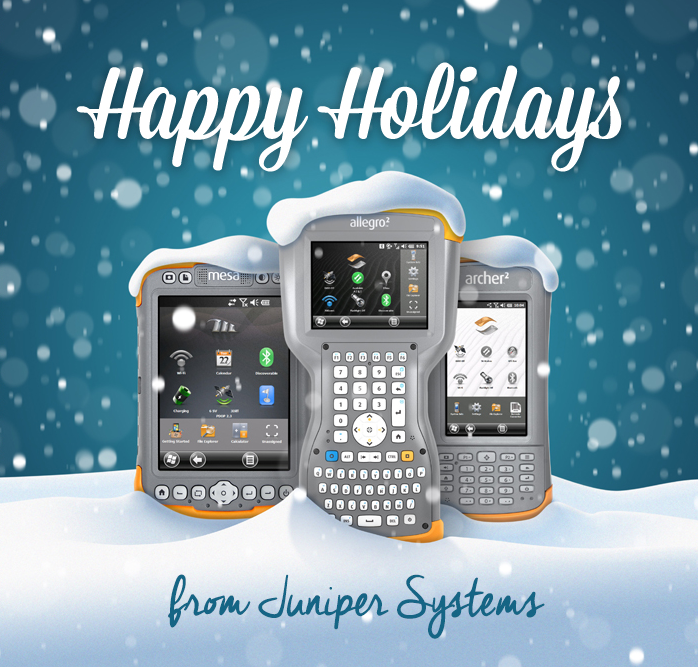 How about Juniper Systems’ new handheld, the Allegro 2! Santa nodded, then questioned: “What about the long night? “No problem there either,” the elf said, filled with glee. “It runs over 20 hours, using Overtime Technology™. and I’m sure you’ll appreciate its use of GLONASS. you’ll keep track of the Naughty and Nice lists with ease. So he took the Allegro 2 on the journey with him. It guided him to every kid’s house, without a problem. and Santa became a Juniper customer for life! we wish you a very Merry Christmas, and Happy New Year too!